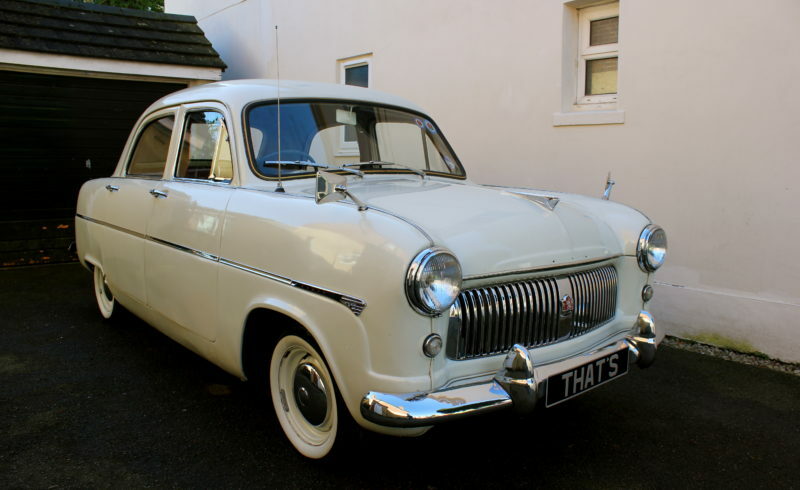 Here we have a gorgeous Ford Consul mark 1 from 1956. It comes with near full service history and only 4 owners from new!! It has the Original 1508cc engine which ticks over so smoothly, benefitting from a recent service including new premium spark plugs and the distributor overhauled. It is the 3 speed column change which is very easy to operate. The interior is in very nice shape with the head lining being replaced in 2012. It has the original red leather bench seats in good condition and very comfortable. The car is sold with the original owners manual, workshop guide, parts catalogue and original log book!! This car turns heads wherever you go and always attracts a crowd, If you are looking for a practical classic you’ve found it!! Starts on the button (pull button) every time its ready to go anywhere!! A rare sight these days and prices are still yet to boom like their sister car the Zephyr. This one will be next! !